M's Red Egg and Ginger Party Mama Say What?! | Mama Say What?! This party that Mama Alex put together looks like it was so much fun! Sadly, this was one party N and I didn’t make it to, but we had fun learning about the traditions behind it. I absolutely adore all of the paper goods Alex created (check her out at Alex Tebow Designs), the cartoon baby is even more adorable! Don’t you think? Enjoy this party! 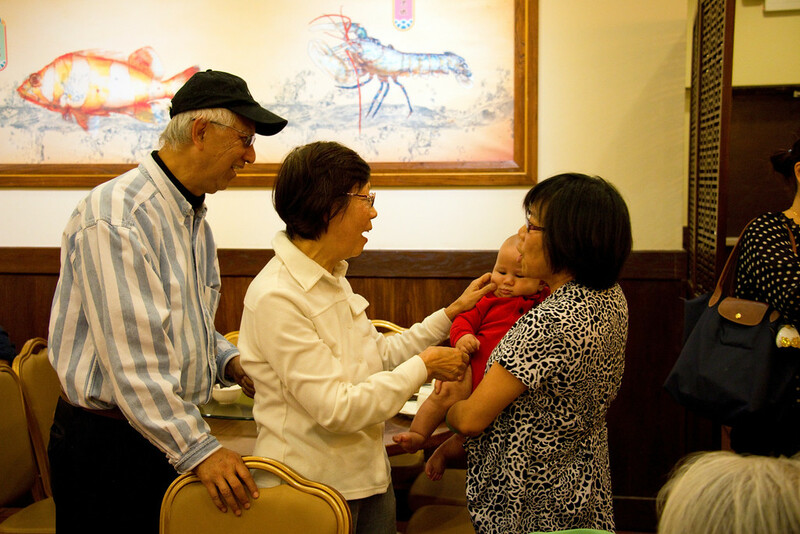 It’s a Chinese tradition to celebrate when a baby turns one month old. During this time, which dates back to when infant mortality rates were high, the mama comes out of postpartum confinement and the parents announce the baby’s name to family and friends. Red represents good luck and happiness. Eggs are symbols of fertility and renewal of life. Ginger is representative of the postpartum mama; an ingredient that’s beneficial for her recovery after birth. Postpartum mamas eat foods rich in ginger and wash with ginger water for that first month. In modern days, it’s not always easy for new parents to have a party when their baby is only one month old. 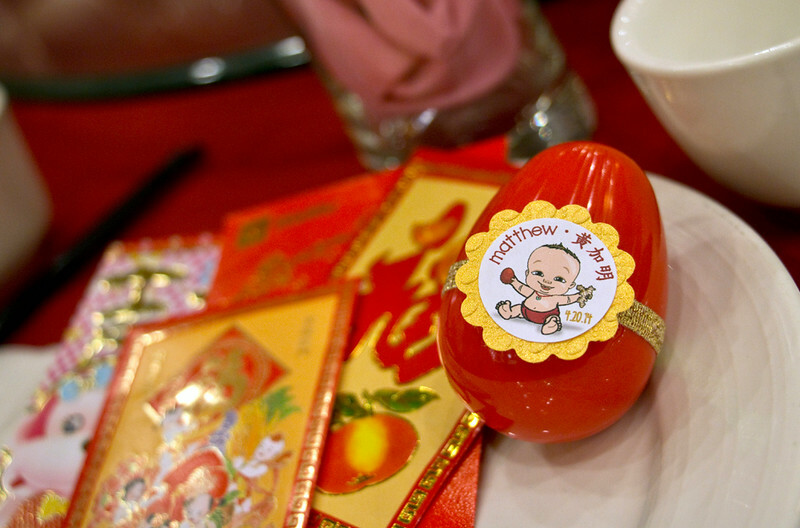 And since it’s also tradition to celebrate when a baby turns 100 days old, many parents choose to have their baby’s Red Egg and Ginger party then. 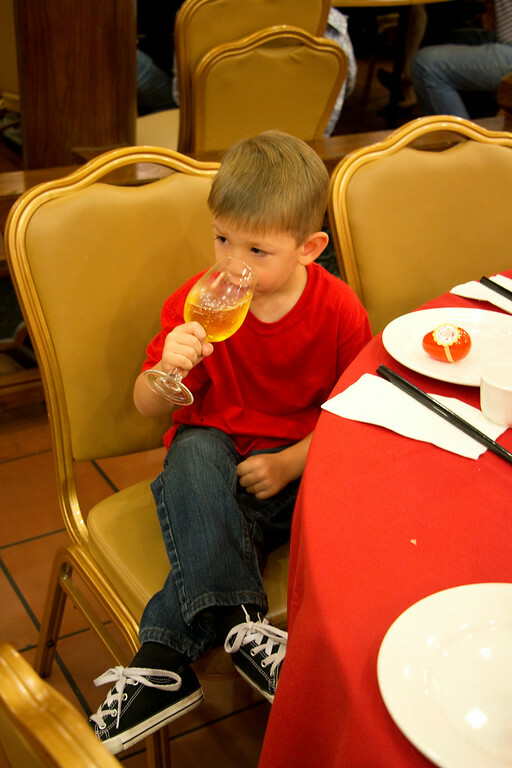 We invited about fifty of our closest friends and family to a Chinese restaurant close to where my in-laws live. 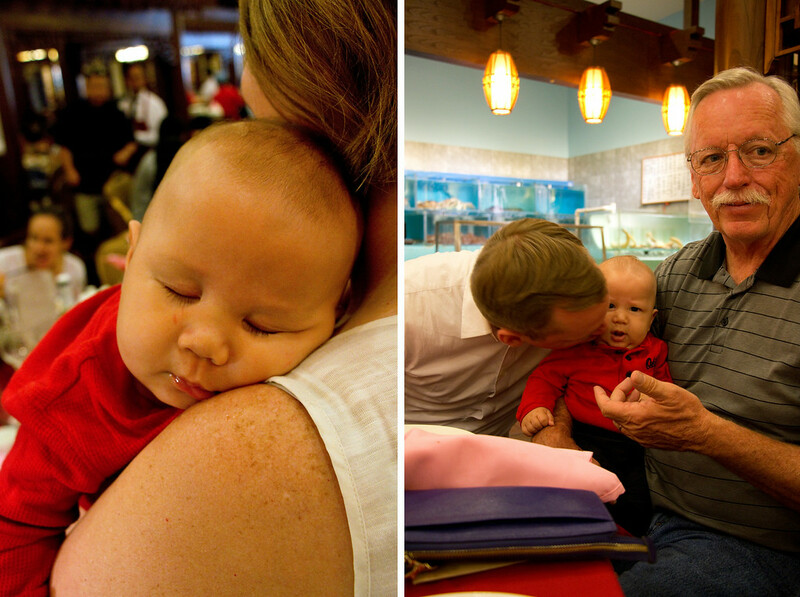 We enjoyed a ten-course, family-style Chinese banquet along with some baby snuggles. What was your favorite element of the party? Aside from my son’s adorable baby rolls, the food was really the star of the party. We had some really delicious plates! 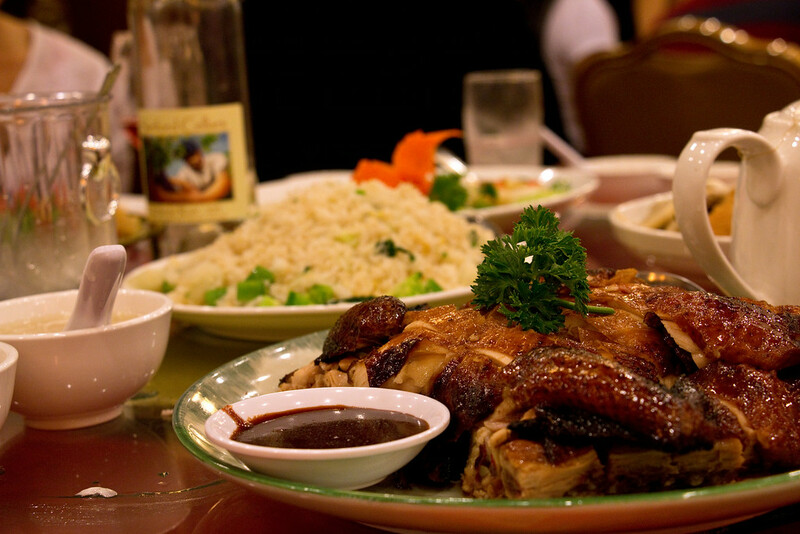 There was a lobster dish, whole steamed fish, roasted chicken, scallops and squid stir-fried with snow peas, pea greens with fish maw, honey walnut prawns, roasted duck, barbecued pork, and fried rice. My uncle is a winemaker and he provided a bottle of wine (or two) for each table. 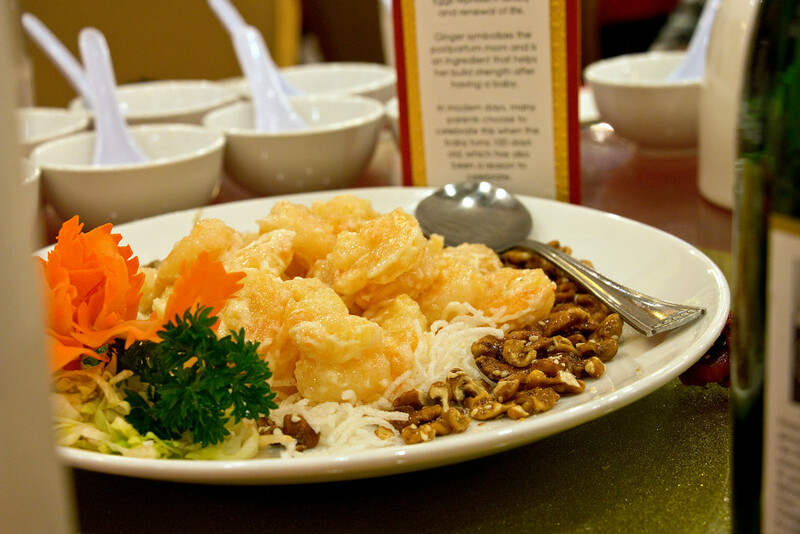 For some of my family members, this was their first opportunity to try these dishes since many of these these aren’t your typical Chinese takeout fare. Tell me about the details. Did you have favors? I designed a fun invitation that we emailed to guests rather than send in the mail. I printed one out to keep in M’s baby book. It’s pretty common to give guests a hard boiled egg that’s been dyed red as a party favor. When we had TJ’s Red Egg and Ginger party in 2009, I was still in a fog of sleep deprivation and insecurity that comes with being a first-time-mama, so I wasn’t involved in much of the planning. If I had been, I would have wanted to add my creative touch to some fun and unique favors. I didn’t really want to do hard boiled eggs and my mother-in-law wasn’t thrilled with the idea of boiling fifty eggs that may or may not be eaten. I looked online and found a place where I could buy red plastic Easter eggs instead. I dressed them up with some gold ribbon and a sticker that featured the little cartoon baby I created and we filled the eggs with ginger candy. I loved how they turned out and my older son TJ, loved being in charge of handing them out to guests. Creating a cartoon baby of M was actually my husband’s idea. 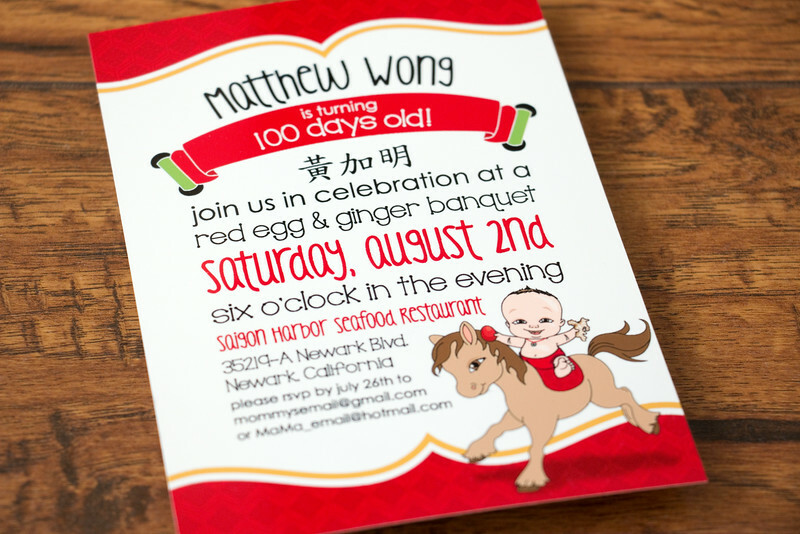 He jokingly said the invitation should have a picture of M holding a red egg and ginger and riding on a horse (it’s the Year of the Horse). I don’t think he expected me to actually do it, but it was such a cute idea, how could I not!? Another fun and functional detail I created was a simple centerpiece. We wanted a simple way to let guests know where to sit. 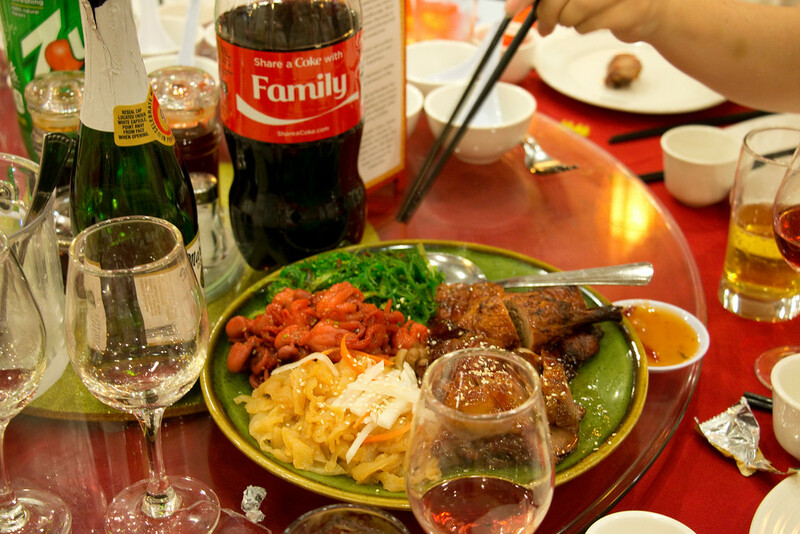 I also wanted to share a brief explanation to my non-Chinese friends and family members the purpose of this get-together. Using card stock and paper, I created a simple centerpiece that stood on its own and was easily moved once the plates of food started coming out. 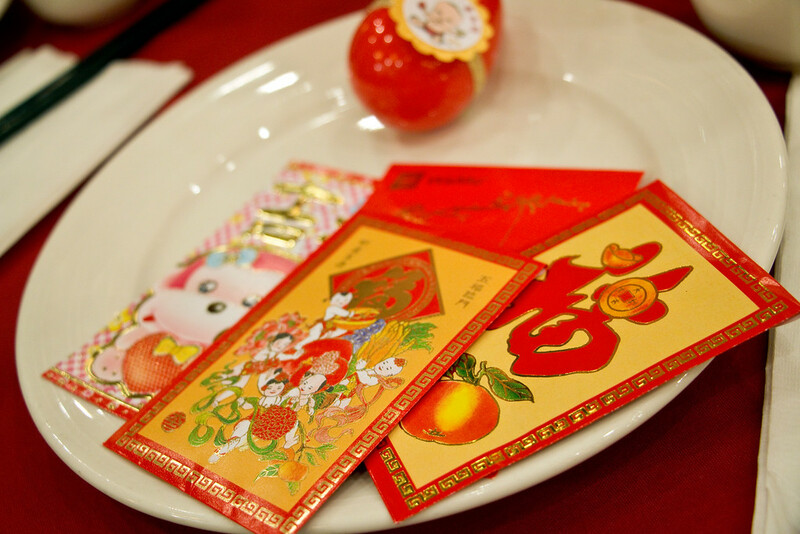 Traditionally, guests give red envelopes called “lai see” to the baby filled with cash or jewelry. There wasn’t one specific moment for me that stood out from others. The restaurant was loud, but the food and the company were all good. 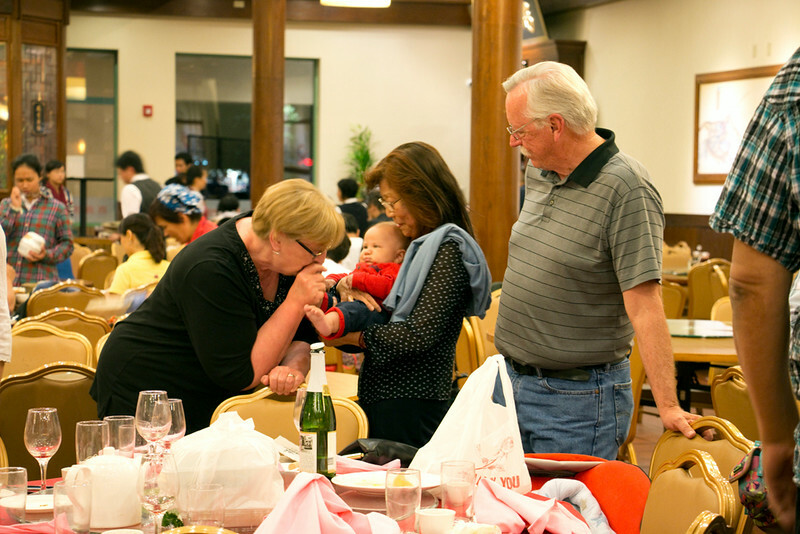 It always cracks me up to see my husband’s aunties argue who gets to hold the baby next. And my little boy was happy and smiling for all of the people who love him. Added by Cari H. on September 4, 2014. I love the creative ideas from this wonderful party. The invitation, decorations and favors all feel really contemporary and fresh. The centerpiece is a great way to help folks learn about the red egg and ginger tradition. One question I frequently get is about appropriate gifts to bring. 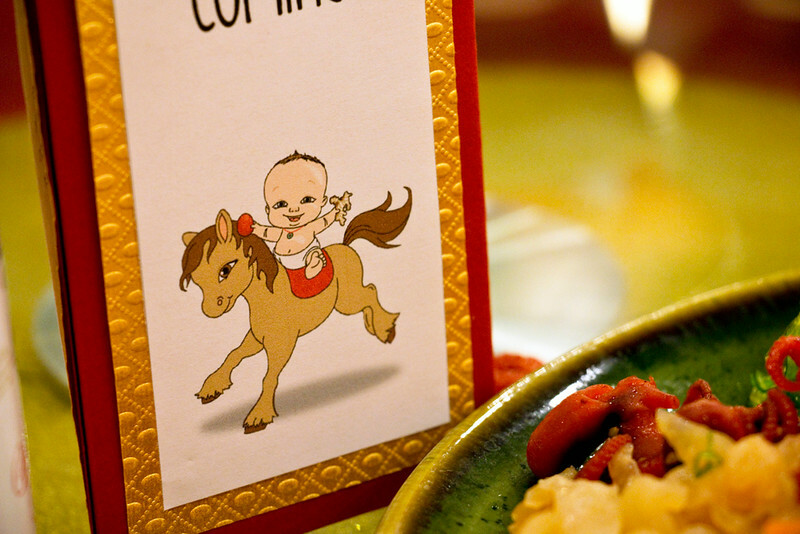 I wrote this guide which may be helpful to other readers: The Ultimate Guide to Chinese Baby Gifts. Thank you for sharing the memories of your wonderful Red Egg & Ginger party! Am learning about Chinese new baby traditions in order to make a gift or gifts for a friend’s first Grand-baby, due in Feb. 2016. Do you remember where you bought the red plastic eggs? Hi Sylvia! I ordered the eggs from here: http://www.toyconnection.com/go/TC/PROD/UEGGR It was the first place I could find them in all red rather than in an assortment of colors. i’m interested in making the red egg favors. would you mind sharing how you made them? is it simply a gold ribbon with superglue for the tags? how did you make the custom tags? totally new to diy stuff. thanks in advance! Hi Nancy! I just attached the gold ribbon with a couple of spots of double-sided tape. The custom tags were designed by myself (I’m a graphic designer), and cut with a circle punch, then stacked with gold paper that was cut with a scalloped circle punch. Thanks!